This soul bowl is serving up something extra special: thyroid boosting goodness. Because there is a big connection between a poorly functioning thyroid and mental health conditions like depression. 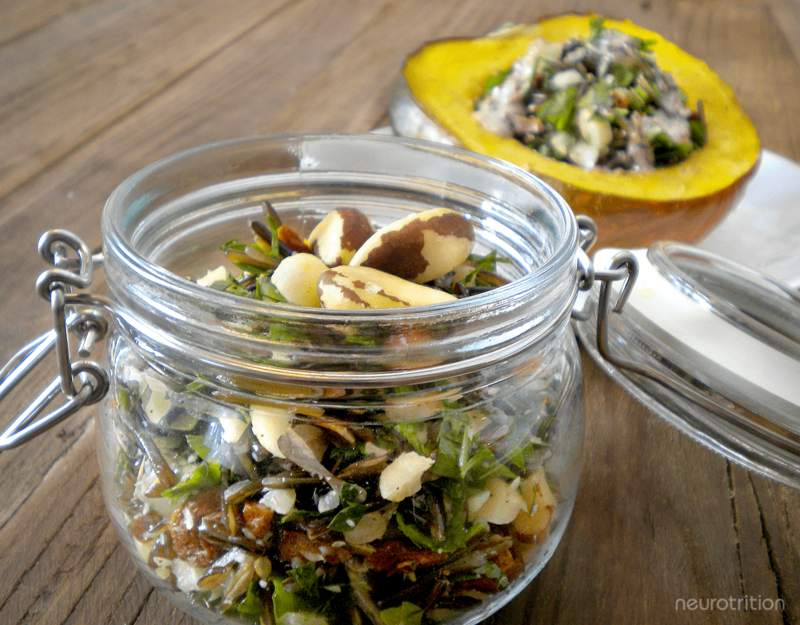 Every single ingredient in this bowl will help improve your thyroid function. So we wanted to put them all together into a simple bowl you can enjoy regularly. If your thyroid is feeling sluggish or you have diagnosed hypothyroidism, our Brain Food Prescription is to eat this bowl at least once per week and to incorporate the foods in its ingredient list on a daily basis. While these foods are important year round, many of us feel depressed as the seasons change and we get less sunlight. One reason this happens is due to lower levels of vitamin D from less sunlight (some parts of the world have chronically vitamin D deficient people and it correlates to low levels of sunlight). Vitamin D is a key nutrient for optimal brain and mental health. It is also a required building block for the production of thyroid hormones. So, from a nutritional standpoint, we can make a clear link between an under active thyroid and a depressed mood (and why sometimes, the symptoms look so similar it can be tough to tell them apart). And one way to feel better is to increase vitamin D rich, thyroid boosting foods—especially during Winter. 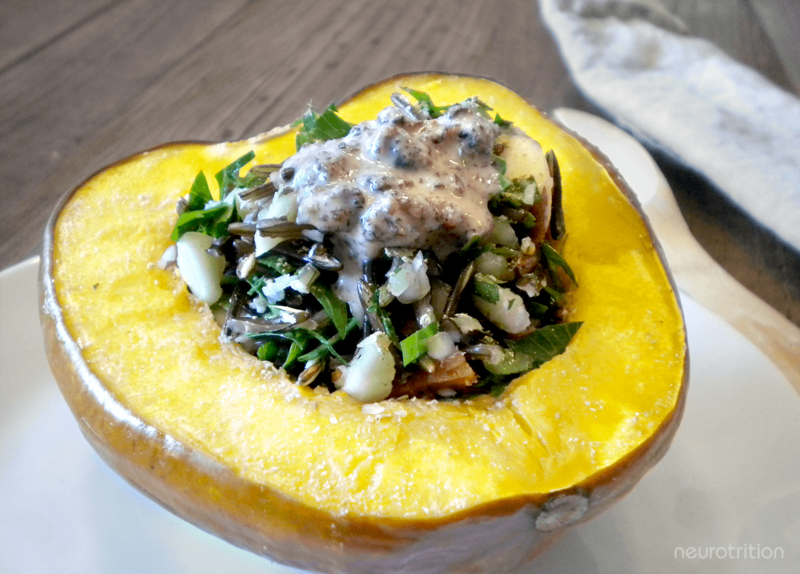 To keep with the Winter theme, serve this soul bowl (or your next bowl worthy meal) in a Honey Roasted Acorn Squash bowl featuring one of our favourite seasonal Winter squashes boasting fibre, complex carbohydrates, and plenty of brain and thyroid loving vitamins and minerals. Slice squash in half lengthwise. Remove and discard seeds. Lay squash skin side up in a shallow baking pan. Pour water into baking pan and bake for 35 minutes. While squash is in the oven, combine the honey (or maple syrup), almond milk, coriander and garlic powder thoroughly. Remove squash from the oven and flip over, skin side down; using a pastry brush or spoon, equally distribute the almond milk mixture onto the squash. Bake for 10 more minutes or until squash is fork tender. Remove from oven, and set aside for 10 minutes before filling. Serve warm. Mix wild rice, nuts, apricots, parsley and coconut oil in a medium bowl, and season to taste. Set aside, until ready to fill cooked squash bowls. In a blender for 30 seconds on high, combine coconut oil, tahini, dried cranberries, sea salt and pepper, then set aside. 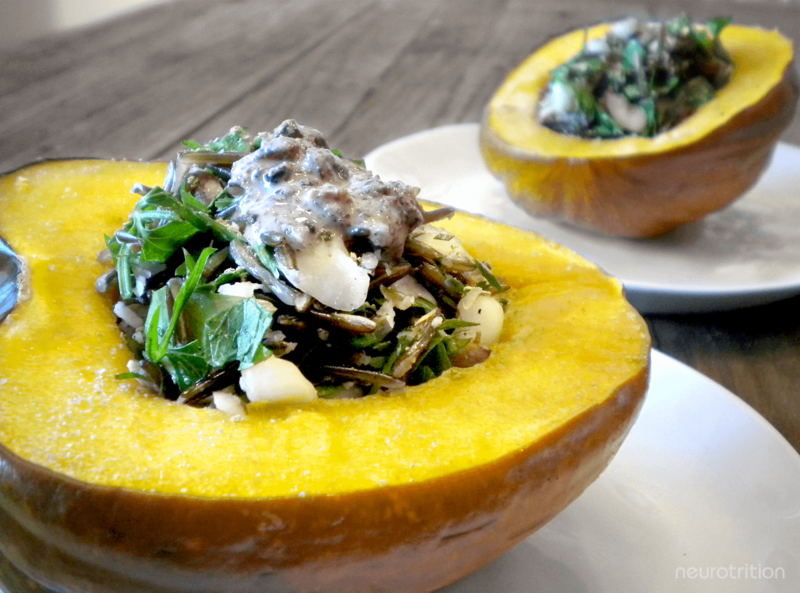 Divide filling between the four acorn squash bowls, top each with tahini cranberry dressing and crushed dried kelp. Ketones made from the breakdown of the fat in coconut might actually have temporary effects when treating Alzheimer’s Disease by enhancing memory. Ketones may also improve our thinking ability so we can break through that mental fog we experience throughout the work day. Parsley has a double whammy effect on free radicals in the brain since it contains luteolin and vitamin C that fight brain inflammation and slow deterioration of our important brain cells. This super herb is rich in many vital brain loving nutrients such as vitamin A (beta-carotene), vitamin K, volatile oils and folic acid. Also known as brown algae, kelp is shown to decrease depressive symptoms, especially during pregnancy. It protects our brain cells and cuts risk of neurodegenerative diseases by decreasing inflammation in the brain and supporting the protective tissue surrounding the brain, spinal cord and sensory nerves. Henderson, S.T. (2008). Ketone bodies as a therapeutic for Alzheimer’s disease. Neurotherapeutics. 5(3), 470-480. Mahmood, S., Hussain, S., & Malik, F. (2014). Critique of medicinal conspicuousness of Parsley (Petroselinum crispum): A culinary herb of Mediterranean region. Pakistan Journal of Pharmaceutical Sciences, 27(1), 193-202. Miyake, Y., Tanaka, K., Okubo, H., Sasaki, S., & Arakawa, M. (2014). Seaweed consumption and prevalence of depressive symptoms during pregnancy in Japan: Baseline data from the Kyushu Okinawa Maternal and Child Health Study. BMC Pregnancy Childbirth, 14, 301. Pangestuti, R., & Kim, S. (2011). Neuroprotective Effects of Marine Algae. Marine Drugs, 9(5), 803-818. Seelinger, G., Merfort, I., & Schempp, C. (2008). Anti-oxidant, anti-inflammatory and anti-allergic activities of luteolin. Planta Medica, 74(14), 1667-1677.